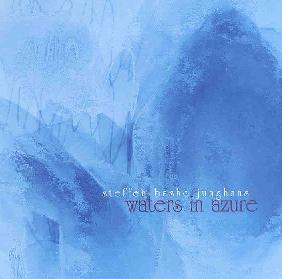 Steffan Basho Junghans - "Waters in Azure"
The newest release from this German artist again explores and expands upon the possibilities of the steel string acoustic guitar. He combines headspinning technical abilities with non-traditional playing styles and techniques, especially in his use of the alternative tuning scales, which makes this a really unique listen. Comparisons to John Fahey, Leo Kottke, and of course Robbie Basho, as well as other artists who have extended the range of acoustic guitar music are certainly applicable - references to their music seem to show up from time to time, but in truth much of this sounds very little like them or just about anyone else. There are four pieces here, and although all are solo acoustic guitar pieces they cover an incredibly wide range of sonic territory. The opener, titled Waters, is a three part piece described as "philosophizing on the different characters of water". On part one he employs a 12 string with slide, plucking notes while creating a constant buzzing with the slide. Part two continues in a sparse mode, reminiscent at times of the solo acoustic work of Derek Bailey. Part three is similar, except that he seems to be using the slide without plucking, and in fact striking the guitar with his other hand to create a rhythmic track. Inside the Rain follows, an 8+ minute 12 string workout that is the most reminiscent of the playing of Kottke. The most amazing thing contained herein is the third piece - One, a three part composition performed with one finger only. Apparently originally conceived as a joke to make at the expense of guitar wanker-types, Steffan uses one finger and rubs, scratches, and plucks multiple strings in rapid succession, often doing multiples of these at once, and hearing this track reminds me of the first time I heard a recording of Robert Johnson and my friend who was playing it for me told me that it was just him playing alone, and that the assumed second guitar player that I thought I heard was in fact Johnson playing two parts simultaneously. Amazing. The final piece (Azure Number 1 >> The Sunreader) sounds influenced by classic minimalist compositions such as Terry Riley's In C, as Junghans slams minimal chord changes home in a repetitive rhythmic pattern over and over until your mind starts playing tricks on you. A tried and true trick. but when done well (as it is here) I always fall for it. A stunning release from one of the most gifted musicians I have heard in quite some time. Waters In Azure is distributed by Strange Attractors Audio House. You can visit their web site at: http://www.strange-attractors.com. Contact via snail mail c/o Strange Attractors Audio House; PO Box 2827; Olympia, WA 98507.